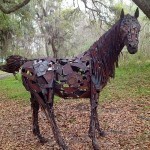 Join us in the metals studio and bring your artistic vision to life by joining recycled steel objects together to create one-of-a-kind animal or figure forms. This class covers safety procedures, the basics of welding, grinding, form building, balance, and composition. Please wear jeans and boots. Bring safety glasses/goggles, and dust masks.